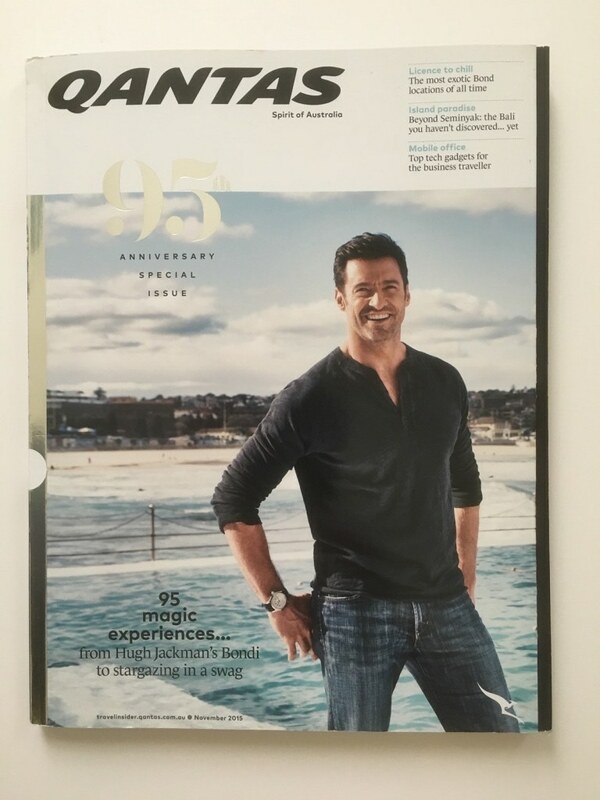 Hi, and welcome to this journey on Qantas! I haven’t written a trip report in a long time but I’ve found some time to do this write up. Part 1 will contain details from the journey from Singapore to Sydney. Part 2 will soon follow with details from my return flight. 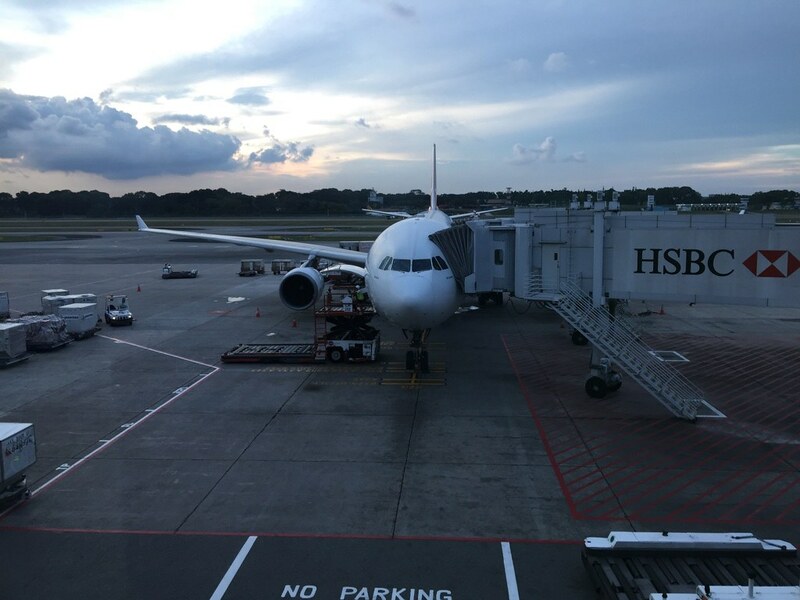 The new cabin for international A330’s would be first flown between the east coast and Singapore and the deployment of future reconfigured aircraft would be focused on Singapore to achieve product consistency. I bought the cheapest economy fare with Qantas, meaning seat selection on international routes comes at a premium. Even though they are now making a profit they still decide to charge AUD $30 or 4000 points to select a seat per sector, which for me, is one of the most off putting things when deciding to fly Qantas. 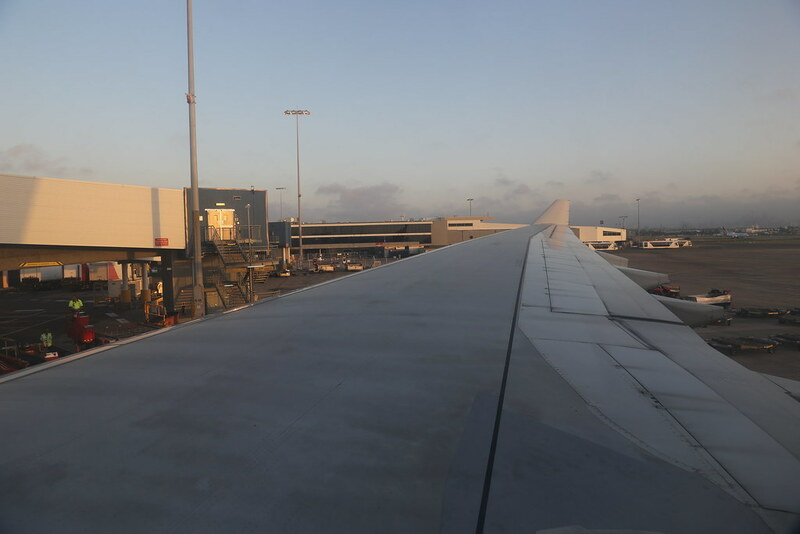 Deciding to save the $60 for my flights I put my faith with the auto assignment system and took a chance with my seat, hoping that with any luck, they will assign me my favourite window seat. Exactly 24 hours before my flight when online check in opens, I log onto the Qantas website and check in. With great joy I find that they have given me 36K, fantastic! But then I realise that the seating configuration is that of an un-refurbished aircraft. My attempt to try Qantas’ new economy seats has failed. I arrived at Changi’s Terminal 1 a couple of hours before my flight and due to Project Jewel, a shopping mall under construction at the airport, the Terminal 1 car park is closed and one of Terminal 2’s car parks has been designated for Terminal 1, with the Sky train being used to transport people to Terminal 1. 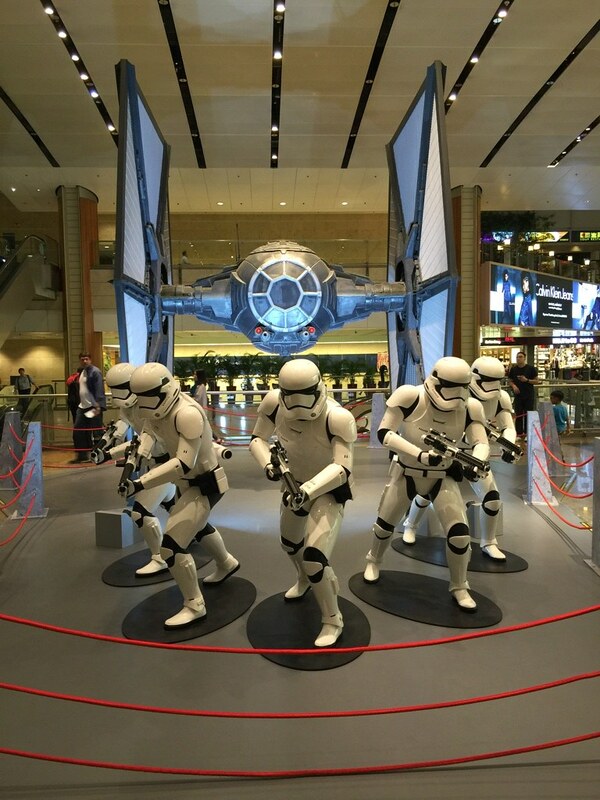 Since I parked at Terminal 2, and being a massive Star Wars fan, I walked a short distance to see the half scale model TIE Fighter, which is part of the promotional activities of Star Wars Episode VII: The Force Awakens at Changi Airport. There is also a full scale X-Wing Starfighter model at Terminal 3. I then proceeded to drop off my luggage at Terminal 1, and as expected from Changi, check in is quick, despite 3 Qantas flights departing within an hour or each other. Immigration was also a breeze as usual and since security at Changi is done at each gate I was exploring airside in no time! I was to depart from Gate C22, which luckily for me is one of the closer gates. 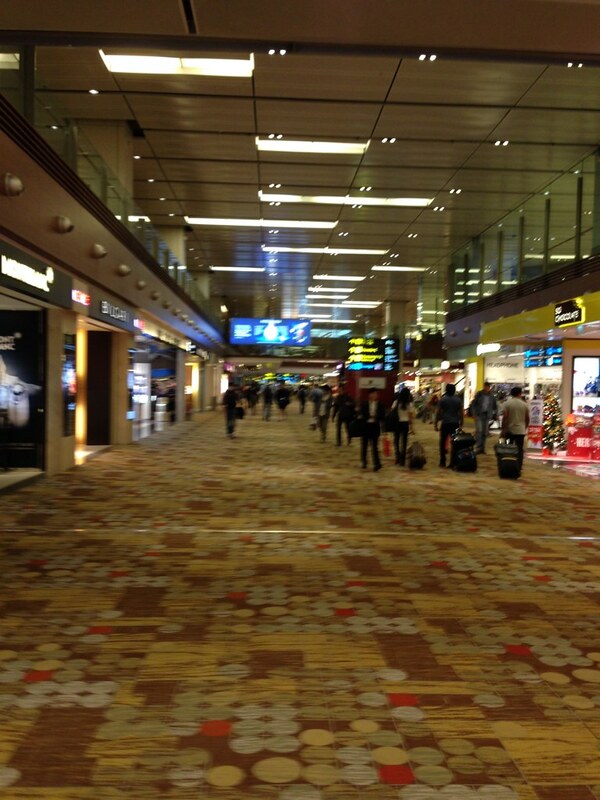 Security was also very quick and I was done within minutes, which unlike the rest of Changi can sometimes take a while, especially for wide body flights. Boarding commenced on time, and since most of Changi’s gates pre-scan your boarding pass, there was no lining up to board. 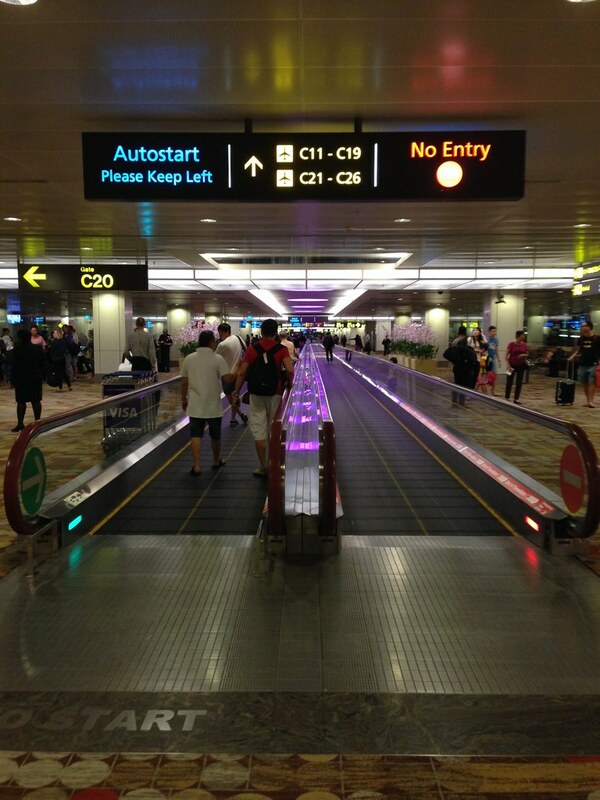 Boarding was done by rows and most people followed the procedure. Once on-board I stowed my roll-aboard with ease, as there was plenty of space in the overhead lockers and settled down in my seat. There is enough legroom but a large entertainment box takes up a third of the space on the window seats, which is very annoying considering that the aisle seat will also have the aisle to stretch out into. The seat itself looks very dated and worn out, which it probably is, seeing as the aircraft is 11 years old. 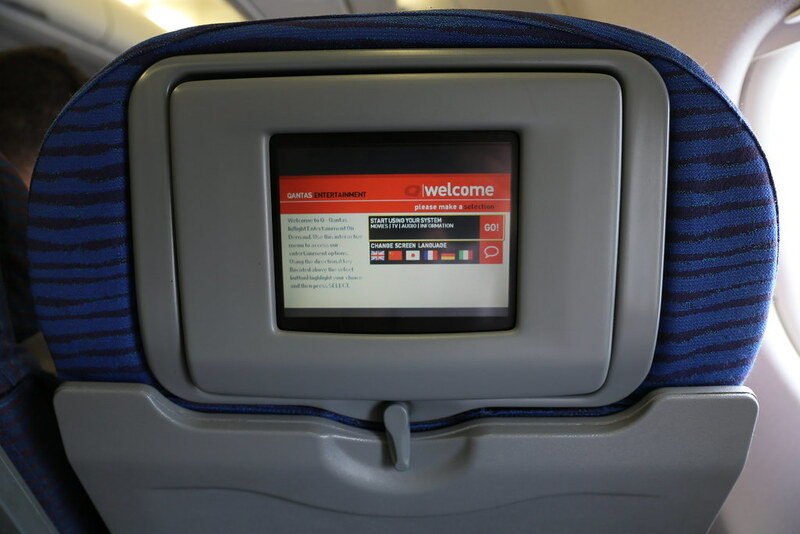 The IFE screen is also very small, and the quality isn’t great, but it does have video on-demand, although containing a smaller selection of content. We pushed back on time. The safety procedures were demonstrated and the video was started, but my screen was blank. Not a problem for me as I fly quite often. We proceeded to taxi out to runway 02C past Terminal 2 and the under construction Terminal 4, which was progressing rapidly. The sun had set by that point and not much could be photographed on the move. 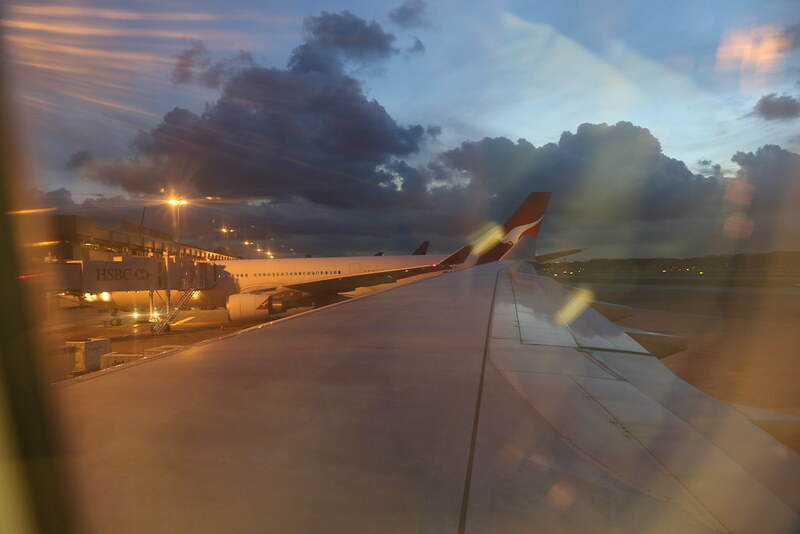 We rocketed down Changi’s bumpy runway and lifted off into the darkness, with the lights of the city only visible after making the turn towards Sydney. Linked below is the video of the take-off. 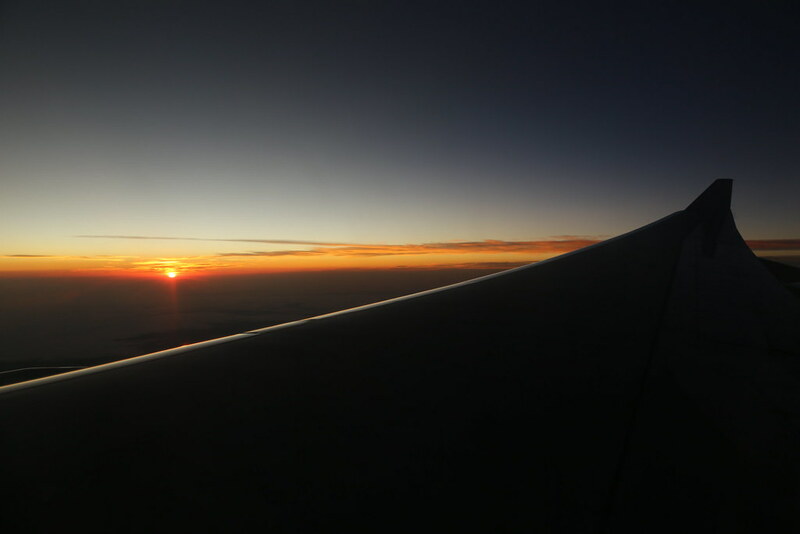 I apologise for the reflections, since the cabin crew strangely did not dim the lights. It definitely isn’t by best work. After take off, the welcome drink (there was one selection) was served by a single flight attendant on each aisle, whom held a pitcher in one hand and a stack of cups in the other. 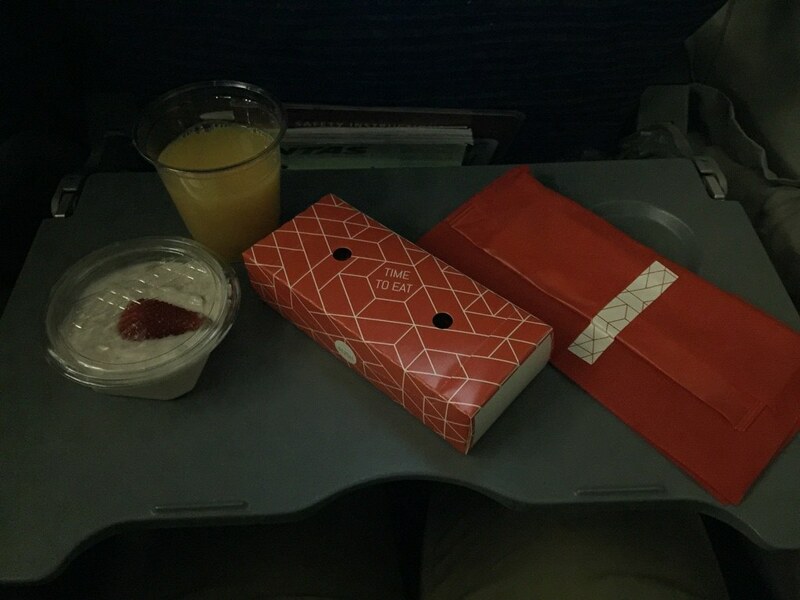 The pomegranate juice was served with assistance from the passengers. We had to take a cup and hold it whilst the flight attendant poured the drink. My drink was served without a problem, but the flight attendant spilled a few drops onto my seatmate. He apologised and quickly rushed to get some tissues to dry off the spilled liquid. Dinner service soon followed and I selected the Chicken option. 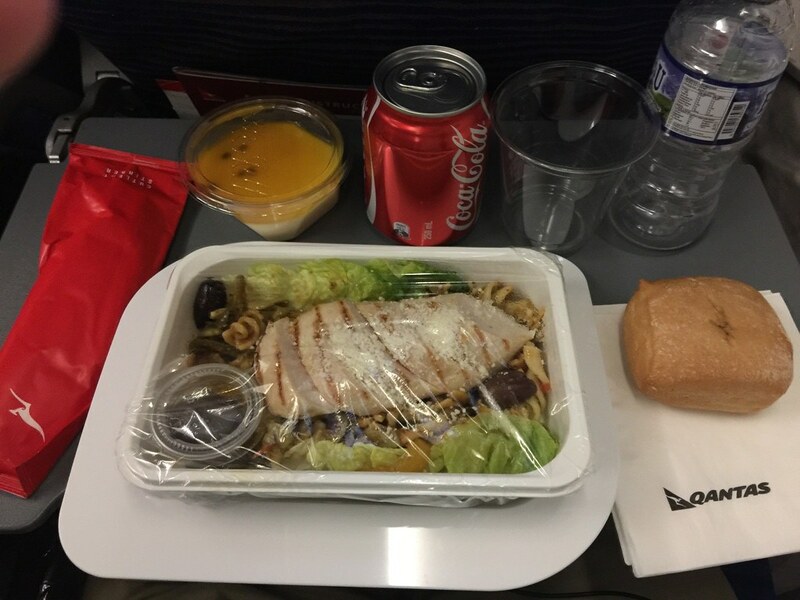 Overall the dinner did not match my expectations and the service has changed since the last time I flew Qantas about 2 years ago. Gone are the trays containing a starter/salad, dessert, bread with butter, and a glass. Now the mains are placed on a small tray barely bigger then the container, and the bread and cutlery are lumped on top of the main. The choices of drinks are still up to par but are served in plastic cups without the option of having ice. The bread roll comes pre-buttered with garlic spread and was nicely warmed up, but a bit dry. The main was served cold which was quite disappointing as I was expecting the chicken and the pasta to be warmed up. The dressing was packaged in a small box within the container, which was quite messy to open and pour. The chicken was dry, and the pasta and lettuce was limp and soft. I regretted my decision to choose the chicken, and the menu description sounds a million times better then it tastes. The dessert was the most enjoyable part of the meal. The passionfruit wasn’t too overpowering and balanced nicely with the vanilla panna cotta. After the crew cleared the dinner service I went for a walk around the cabin. The forward cabin was fully loaded but as I headed down the back there were empty seats scattered around, especially in the last few rows. The lights were dimmed soon after and I settled down to try and get some sleep. Unfortunately for me I couldn’t. The cabin temperature was very cold and even with the blanked and the air con vent closed I couldn’t get comfortable and kept drifting in and out of sleep. After a few hours to attempted sleep I gave up and started watching a movie on my iPad, seeing as the screen quality is far better then the IFE. Soon streaks of light began appearing on the horizon and before long the great orange ball of fire we call our sun rose up. Breakfast service soon started and there was only one option. 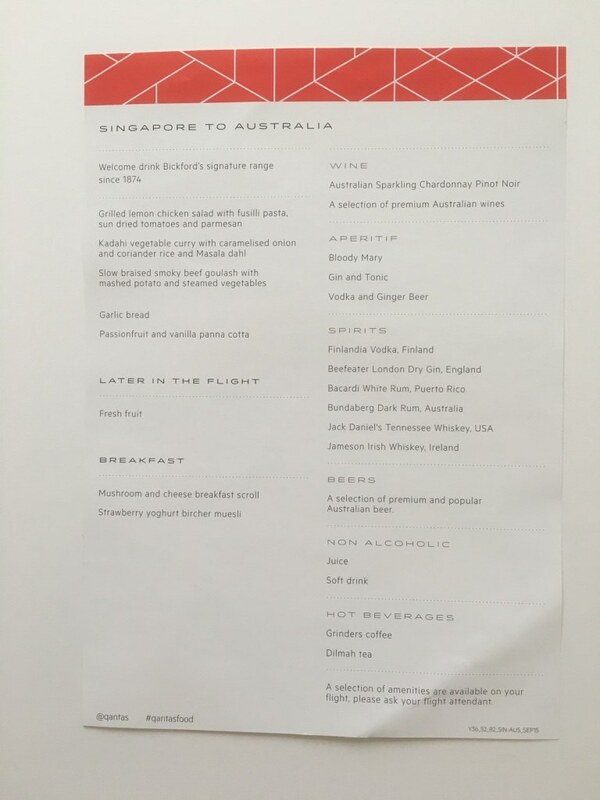 After checking some old photos I realised that the breakfast menu has largely remained unchained since I last flew Qantas on this route and surprisingly the portion sizes has increased. The yogurt was nice but only contained half a strawberry. The scroll was warm and very flaky but was very dry. It also had barely any taste of cheese and no taste of mushroom at all. Overall the breakfast wasn’t substantial enough for me but is sufficient to fill be up till I arrive to have a proper breakfast. We began our descent and after making a few turns we landed on runway 16R. We were one of the first arrivals of the day after the night curfew was lifted. Linked below is the landing video. Deplaning was fairly quick and the terminal was very empty. I tried the automated immigration clearance again, but failed, again. The machines must not like my face. I headed over to the empty counters and quickly cleared immigration, the perks of being one of the first arrivals. Baggage claim was fairly quick and customs was cleared rapidly too. Unlike my usual Sydney airport experience, this one was smooth. My failed attempt at trying Qantas’ new economy seats made me realise how much the new seats are needed as the decade old product really shows its age. The cost cutting in food and drinks are very apparent, but the service has improved. The crew are friendly and feel quite genuine, not scripted or robotic. 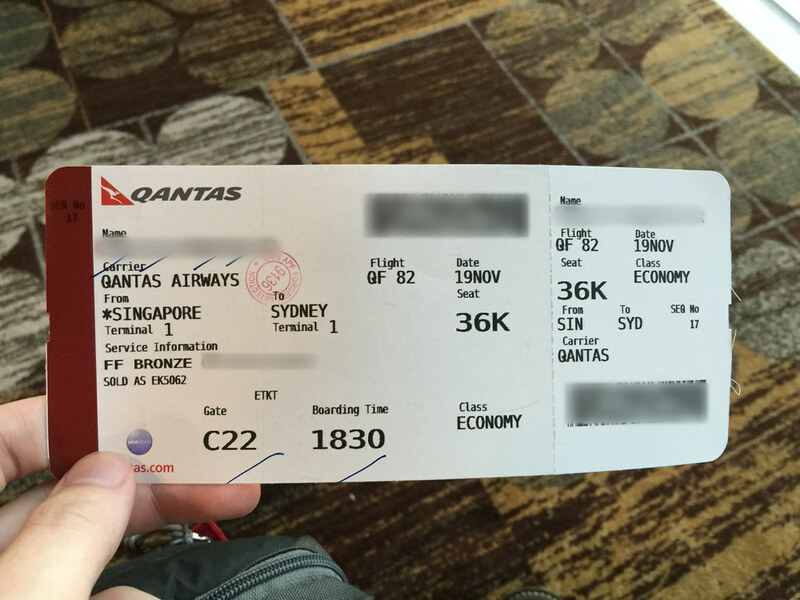 Overall the flight was decent enough and a fairly average Qantas flight. Part 2 covering my return flights is coming soon. Please feel free to share your opinions on my report, I always look to see what I can improve on and add to, for future reports. Enjoyed reading your trip report Julian. I look forward to Part 2. 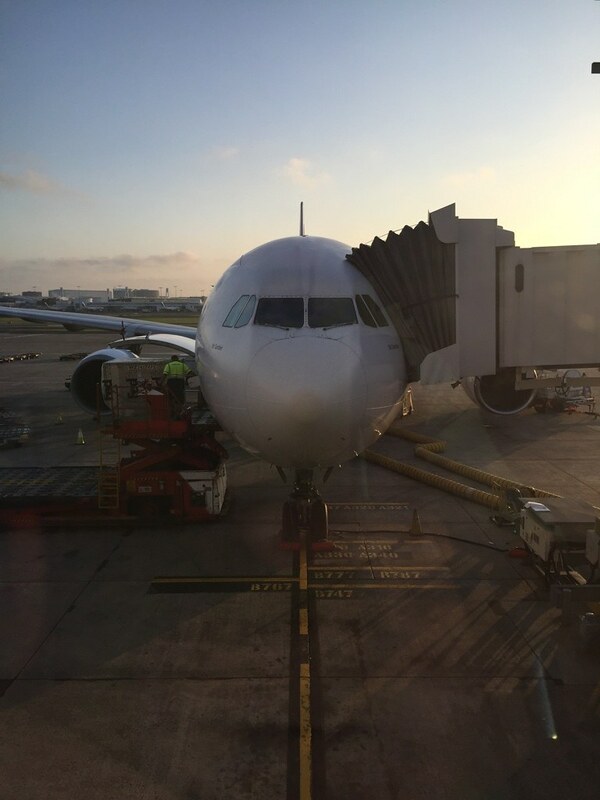 I have just returned from Cambodia/Thailand and flew on a refurbished A330. I was pleasantly surprised by the seats and large IFE screen (and the library of video treats). Nice trip report Julian. Always interested to read a detailed account of ones experiences. I also flew to Cambodia (via Bkk) a couple months back. I also purchased my ticket through EK saving the wife and I a bit under a grand. I was also disappointed to have the old product onboard QPH in both directions!! Doh! Interestingly I have fonder memories of my meals, I don't recall what I ate just that it was tasty. I do remember that my rolls and side salad were placed on a napkin on my tray table and not served to me sitting on top of my main. Thanks for the report, interesting to read. The following is taken from a reply I posted in the Registration Requests - many of your comments resonate with my experience of the -300's that are yet to be refurbished (fortunately, the number is getting smaller !). Sadly, the experience on a refurbished -200 was not really much of an improvement. At the point of travel, I had not experienced the upgraded version, however, QPJ was tired and in need of a refit - service and meals were exceptional (brilliant team that delivered outstanding service across the board), however, IFE was appalling (needed to be reset about 7 times during the course of the flight) and general appearance was tawdry (seats marked and very scuffed, grotty - but clean - toilets and dodgy tray tables). Return to Oz flight was QF42 from Jakarta and was excited to get a refurbished -200 (EBJ). Sadly, having preceded that flight with several on Emirates A380/B777, the experience of the 330-200 was a real let-down. Cabin looks and feels great, however, the IFE (iPad) was dismal (of our group of 4, we needed to reset no less than 4 times each, we used 7 units across the flight and even then, were not able to access the desired programs). Despite the fact the seat-back seems suited to a larger unit, the provided version was minute and not particularly conducive to easy viewing. The saving grace was the crew who were exceptional (again) at servicing a pretty full flight. That said, the provided meals were an odd selection and they were delivered via a very small tray that was stacked high rather than one which could easily accommodate food and drinks. Overall, I can honestly say service of both flights was of the highest order (better than Emirates), however, this was not even closely matched by the fit-out of either the tired QPJ nor the refurbished EBJ. Would like to see QF take some tips from EK on IFE and cabin layout.